Our exercise sessions are held in the Physiotherapy gym, which is part of the Physiotherapy Unit at the Wharfedale Hospital. 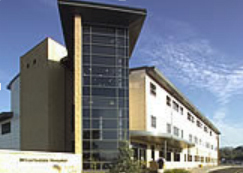 The hospital is on Newall Carr Road, Otley LS21 2LY. The Physiotherapy unit is well signposted in the hospital. To reach it, enter the hospital via the North entrance, which is off the main car park. Immediately after the entrance doors, turn right and take the stairs or the lift down to the lower ground floor. Go through the security doors directly opposite the foot of the stairs, turn right and then immediately left into the long corridor. The Gym is on the right through the doors at the end of the corridor. Please note that the security doors opposite the stairs may be locked at certain times (usually after 5.30pm). If this is the case, we normally have one of our members stationed at the door to allow others to gain access. If there is no one there, please wait to be let in. Anyone arriving late may be able to gain direct access to the gym through the rear entrance from the service road at the back of the hospital. For those using public transport, the 965 bus runs from the bus station in Otley to the hospital. Information on the times of buses can be obtained from the Metro Line on 0113 1457676 or from the Metro Line website (click the Metro logo above). For those driving to the hospital, the hospital has a large car park, which provides easy parking. There is a charge for parking, but we are normally able to provide members with a car park permit, which gives free parking ​when displayed in the car window. Car park passes are only valid for attending the Club's exercise classes or on other official Club business. They may not be used for other visits to the hospital.